Summary: Wondering how to keep your deposit customers happy while interest rates rise? Companion deposit accounts may be the answer. 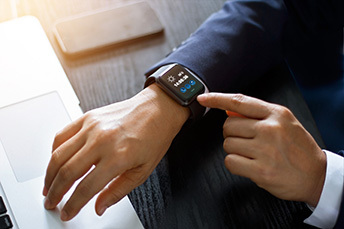 In an interesting technology advance, Microsoft said it will now allow users to sign onto their accounts using its Authenticator app and an Apple Watch. No password is needed and authentication can occur right from the person's wrist. New things keep popping up in the technology world and the same could be said about interest rates in the banking world. In fact, now that interest rates are on the rise, people naturally are looking for a greater yield on their deposit accounts. Interestingly, the data shows people seemingly don't want to lock up all of their money to get a good yield, nor do they want to get dinged with hefty early withdrawal fees. That hopefully leaves room for community banks to operate. Speaking of deposits and funding, one strategy we have heard of is to offer customers "companion deposit accounts". These give depositors a companion high-yield savings account that pays like a CD, if they open a regular CD too. In this way, customers are incentivized to put some money into a CD, and other money into a high-yield savings account that pays the same rate with no early withdrawal penalty. To minimize cannibalization of low-yield or non-interest bearing accounts, customers who commit to these bundled offerings can't deposit more money into their high-yield savings account unless they open another CD. This strategy could pay off for a bank perhaps so some banks are trying it out. Indeed, one of the vendors for this type of white-labeled bundled offering says that the first group of community banks that launched it collectively saw an 11% rise in long-term retail deposits in Q1 2018. One community bank in IA offers this type of product and tells its customers that it is the best in savings: "high yield and no commitments." Interested customers must open and fund both accounts the same day, but that doesn't seem to be a show stopper for customers. Under the program, there are no minimum balance requirements for companion deposit accounts - nor are there monthly service charges or transaction fees for withdrawals. Meanwhile, a MA credit union positions its companion deposit account as a product that offers a "great rate combined with total liquidity." This combination is designed to appeal to customers to stop them from leaving for higher yields elsewhere. Yet another bank in ND tweets whenever it automatically raises rates on its companion deposit accounts to match rising rates on its CDs. Still another Midwest bank has the catchiest tagline for its bundled offering. It pitches: "Milk & Cookies. Peanut Butter & Jelly. CDs & Companion Accounts. SOME THINGS GO BETTER TOGETHER." As customers look for ways to get high yields without having to tie up all of their money, community banks may want to think about a companion account strategy. It won't work for all, but it is an interesting twist to think about perhaps. As interest expense rises along with the rising rate environment, any improvement in the cost of funds can positively impact returns. Moebs research finds the average checking account customer has more than $3,700 in their account, considerably more than the average of less than $1,000 in 2007. Bloomberg reports Barclays estimates five of the largest US banks have reduced their municipal bond exposure by almost $16B in 1Q of this year and an estimated $6B more in 2Q. Lower corporate tax rates have reduced the benefits of holding these securities compared to other options. Small businesses lose more per fraud than large businesses with a median loss of about $200k per fraud vs. $104k for large companies, according to the Association of Certified Fraud. Examiners. A Clearing House survey reveals 67% of consumers who use nonbank fintech apps are extremely or very concerned about data privacy. That said, a whopping 53% said they did not care or would be more likely to use an app, if it accessed financial data for purposes beyond the use of the app. The chief economist for the Bank of England is warning artificial intelligence (AI) has the potential to displace large amounts of jobs and create social and financial tensions.